Some 40 miles north of Atlanta, Bartow County once promoted itself as being not the big city, but a bucolic retreat from the hustle and bustle. These days the county’s proximity has proven to be the catalyst for some transformative economic development opportunities. Exhibit A in this changed thinking can be found just south of Cartersville in the sprawling new development known as LakePoint Sporting Community and Town Center. In what was once a largely rural expanse of rolling hills and woods near Emerson, a massive 1,275-acre complex of playing fields, retail, residential and commercial centers is starting to take shape. When it opens next year, LakePoint is expected to attract four million visitors annually to what developers claim is the nation’s biggest sports vacation destination. The $1-billion development includes a 262-acre sports complex along with a commercial, retail and mixed-use community. The privately funded project will host baseball, fast-pitch softball, lacrosse and soccer tournaments year-round. It will also include an 114,000-square-foot indoor facility for wrestling, cheerleading, gymnastics, martial arts and volleyball. “(This development is) very exciting for our community and may be the largest commercial project going on in Georgia right now,” says Bartow County’s sole commissioner Steve Taylor. Local residents know they have gotten quite a catch, and officials have been working hard to ensure the project moves along unimpeded. The sheer size of the project is likely to transform not just this section of Bartow, but the entire region as venues continue to open over the next couple of years. In all, LakePoint is expected to create more than 26,000 direct and indirect jobs, along with $210 million in visitor spending annually. The project is the culmination of an effort begun two decades ago when a group of local landowners cobbled together the parcel and began marketing it to prospects looking for space to expand. LakePoint is being touted as the ultimate youth sports destination in America. It was this location and access that were important for developers as they searched for a site. In keeping with the vacation theme, LakePoint will sport thrill rides. The Polercoaster, created by “inventioneer” Bill Kitchen, designer of Florida’s SkyCoaster and SkyVenture, will be over 325 feet high. The ride will be the tallest coaster in the Southeast and one of the top 10 tallest in the country. The tournaments that are the main business of the development will be driven by three major sports organizations. These include Perfect Game USA, which relocated its headquarters here from Cedar Rapids, Iowa; and Braveheart Sports Events, a partnership between the North Atlanta Soccer Association (NASA) and LB3 Lacrosse. The park expects to host some 5,000 teams from around the country and the world. In all, the development will provide tournament-playing venues for more than 20 different sports accommodating young athletes. With more than half of tournament participants coming from outside the state, a location north of Atlanta made sense, she adds. While LakePoint developers didn’t originally envision their sporting complex growing into a major mixed-use development, access to the land spurred some hard thinking about how to make it not just a place to play sports, but a true destination for parents and young athletes. LakePoint’s impact can be seen in the people and companies eager to get in on the action, including major retailers such as Bass Pro Shops, which will open a 100,000-square-foot Outpost store that will bring some 200 jobs. The store will sit next to a 300-acre nature park with hiking trails – another attraction for the outdoorsy set. Greg Norman, the world famous golfer known as the “Great White Shark,” will bring a 30-acre Greg Norman Champions Golf Academy along with a full-service practice range, a nine-hole par-three course, and coaching and instruction. Research into sports safety is also going to be a big part of LakePoint’s appeal. Coke is launching its first-ever Powerade Sports Safety Hydration Lab. The hydration lab, which will be housed at an indoor facility called the International Training and Perform-ance Center, will have a ready stream of test subjects in the form of thousands of players competing here annually. In addition, carpet maker Shaw Industries will relocate its Sports Turf division to offices on the site. Here, customers can see the firm’s synthetic turf in action. Reshaping the rolling hills of North Georgia to suit baseball diamonds and arenas has been a massive undertaking. In fact, the pace and order of development has been shaped by the topography of the land. Getting this project off the ground has required considerable investment by the community and some faith that spending now will pay off with increased revenues later. The county put up about $1 million to match $4.2 million from the Georgia DOT to re-route a state highway through the property, says Taylor. The influx of people and development will also require opening new fire and EMS stations in the area as well. Along with the promise of LakePoint, locals are also seeing more traditional business and industry make a resurgence. 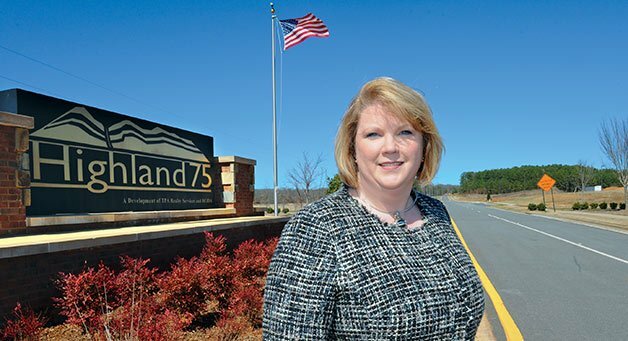 North of Cartersville in the 707-acre Highland 75 business park, Austrian-based voestalpine is building a new $62-million manufacturing facility. The company plans to add 220 workers to make pressed parts and structural components for Mercedes, BMW and Volkswagen. The company needed a new building customized for their needs, but they had to get it up and running fast to meet order deadlines. Bartow County was able to partner with them to ensure there were no delays in the construction, and that proved a strong selling point, according to Lemmon. One of Bartow’s biggest employers, Shaw Industries Group, also made an $85-million investment in its floor covering operations in Adairsville. The 600,000-square-foot manufacturing facility will produce modular carpet tiles and add about 500 jobs. A $371-million expansion of the Toyo Tire North America Manufacturing facility in White will create 650 new jobs and add 700,000 square feet to the current 2-million-square-foot manufacturing facility by the end of 2017. Additionally, the company will add 30 percent more warehousing space. The county also became home to an ethanol storage and distribution facility opened by Eco-Energy Holdings. Train cars will deliver up to 400,000 barrels of fuel to the facility, which will in turn distribute it by truck to customers throughout the Metro Atlanta area. The logistics operations will employ 10 people, according to Lemmon. Bartow has been able to secure these projects in large part because it now has industrial and business park space readymade for getting an operation up and running quickly. “When I got here in 2004, the community had missed out on some great opportunities because there wasn’t a piece of property that could handle a 100-acre development,” Lemmon explains. The 188 acres that were rezoned for Pattillo represent more industrial and corporate property available and is “a notable for the community,” she says. Retail has also started to come back in Cartersville. Academy Sports + Outdoors is opening a 72,000-square-foot store on the former site of a now closed Kmart. The new store in Cartersville Crossing at Main Street and U.S. Highway 41 will employ 150 people. The former home of Kmart was demolished along with some of the adjoining spaces. Current tenants were relocated and leases renewed as two new buildings were constructed to accommodate Academy and another national to-be-announced retailer. The remaining stores will stay, according to press reports. Another driver to the local economy has been healthcare. Cartersville Medical Center has almost finished a $30-million expansion to double the emergency department, add a patient floor and fix up the building façade; the project is expected to bring 100 temporary jobs and 45 permanent ones to the community. While downtown Cartersville may look much as it did decades ago, this collection of historic 19th-century buildings has also undergone something of a renaissance. While many storefronts in this traditional downtown built around a rail line are occupied by lawyers, accountants and other service providers, there has been a definite upsurge in retail and restaurants. The city is also seeking developers for its now-vacant police and fire stations. A funeral parlor in the 1940s, the building became police headquarters until the construction of a new public safety building a couple of years ago. The ultimate goal is to foster more people downtown, which will in turn generate more events, more nightlife and more vibrancy, she adds. Bartow has already started to develop something of a reputation for the ability to handle big-time events, according to Ellen Archer, executive director of the Cartersville-Bartow County Convention and Visitors Bureau. The nationally known CounterPoint Festival at Kingston Downs has brought the likes of Outkast and 75 other acts to the three-day music and arts festival. The venue is also the home to the Atlanta Steeplechase. “We’re enjoying a bit of a boom right now,” she says, echoing a feeling held by many that Bartow County is well on its way to a brighter and more prosperous future. Cartersville may be a small city in North Georgia, but there’s nothing small time about its cultural offerings. When the Booth Western Art Museum opened with its extensive collection of paintings, sculpture and photographs chronicling the great American West, it became a catalyst for other venues. Now locals can boast about attractions such as The Grand Theatre, Bartow History Center and, more recently, the Tellus Science Museum. In fact, much of the retail and dining along Church Street near the Booth in downtown Cartersville has appeared since the museum opened in 2003, according to Tara Currier, manager of the Cartersville Downtown Development Authority. The Booth, which has earned a national reputation for its collections, offers visitors paintings by some of the nation’s best artists along with sculptures housed in a two-story court. There are also artifacts such as authentic stagecoaches, Western movie posters and some of the original art that graced the covers of Western novels. You can also tour a collection of Civil War art and a Presidential Gallery with signed letters and images of every American president. Open since 2009, the Tellus is in the 125,000-square-foot building that was once the Weinman Mineral Museum just north of Cartersville. Along with a new and high-tech mineral hall, Tellus offers a digital planetarium, fossils (including full-size dinosaur skeletons) and a transportation museum with vehicles ranging from an early steam-powered car to a replica of an Apollo space capsule. Children of all ages can take part in their science experiments, and many have – the museum was set to welcome its millionth attendee in March. For those seeking an understanding of the region, the Bartow History Museum, which is housed in Cartersville’s historic 1869 former courthouse, provides an extensive collection of artifacts, photographs, documents and interactive permanent exhibits telling the story of settlement, Cherokee life and removal, and the devastation wrought by the Civil War.